Home Archives LOUFEST 2018 CANCELLED! 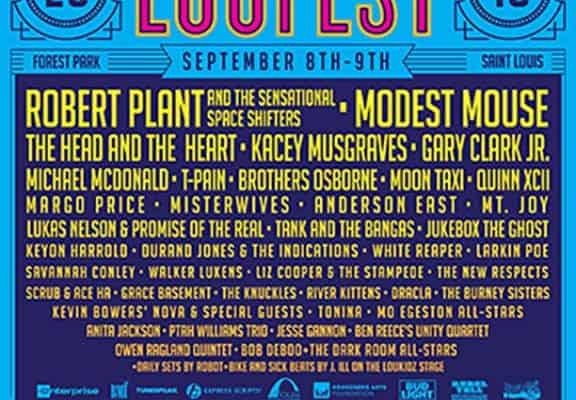 In a disappointing blow to St. Louis concertgoers, the organizers of LouFest have announced that they’re cancelling the annual festival. The festival’s organizers cited weather, the loss of two major sponsors, and issues with talent. Several reliable media sources are reporting the real reason for the long-running festival’s cancellation was multiple disputes over unpaid bills and cancelled agreements. Whatever the reasons, people are disappointed. LouFest has been an annual rite of fall for thousands of music lovers and a source of pride for the city of St. Louis. In the high-stakes business of concert and festival promotion, this is not as rare as many civilians think. It’s a high-risk and high-reward business and not for the squeamish. Still, you’d think that the organizers of LouFest would have had this down after many years of running the festival. We at Sonic Nation noticed that the clear communications that we had enjoyed with the festival’s organizers in previous years, disappeared. Journalists and photographers saw the August deadline come and go with no response from the festival’s media team. Well, there’s still a lot of wonderful live music out there to enjoy. We are sad to announce that LouFest 2018 has been cancelled. We know this is a great disappointment to many and that there has been wide speculation around our event. We want to share what’s been going on directly with you. Overcoming those setbacks while trying to grow the Fest has been a challenge, one that LouFest was on target to meet until a bit of unfortunately timed media coverage caused many of our vendors and artists to demand up-front payment just days before gates were set to open. LouFest simply couldn’t make that happen. Second, the fickle St. Louis weather has made us extremely nervous. 2018 pre-sale ticket volume has been fantastic but the festival does rely on walkups to be financially successful. We know first-hand that a rain-soaked weekend like our event experienced in 2016 would both kill that traffic and do physical harm to Forest Park. We feel it would be irresponsible to continue to invest in an event that might not be able to realize its exceptional potential. Although we don’t currently have the funds to issue refunds, the exceptional festival ticketing company we selected, Front Gate Tickets, owned by Live Nation and Ticketmaster, will be stepping up to refund all fans in full while we work to repay our debts. We want to recognize the sponsors, vendors, partners, and fantastic team members who have been working around the clock in support of LouFest 2018. Producing this event has been a labor of love for our family and the staff – we see it as our gift to our music-loving city. Previous PostA Show To Sink Your Teeth Into: Red Fang @ the Firebird. Next PostSeptember is the Motherlode of Festivals.